First good news is that we will soon include the ROI course into the Full MEDDIC bundle. The reason? I explained it in a previous blog post: The whole purpose of Metrics is to develop an ROI pitch, and I notice most reps don’t know how to do it. Also in this video we were stating that METRICS without ROI is as useless as Knowledge Without Action? So I want everyone to take that course. Since this will provide more value, we’re adjusting the price of the bundle accordingly, only for new subscribers. The second good news is that existing subscribers with the Stripe recurring payments (i.e. all paying users), will not be concerned by the price hike at the time of annual renewal, as long as those subscriptions are kept as is. (i.e. not cancelled). The plan will be automatically upgraded with access to the new ROI course, but the renewal price won’t change. Of course if the user cancels their subscription, any new subscription will be under the new pricing. The third good news is also for existing subscribers who have subscribed to the MEDDIC bundle but have not purchased the ROI course. They’ll automatically be enrolled to the ROI course at no additional charge. This is also for those who wonder from time to time, what is the benefit of a subscription. Our response is that the course gets enriched regularly. We added the “How to develop champions” course to the MEDDIC bundle a few months ago. And now we are adding the ROI course. The fourth good news (that’s a lot of good news all on the same day), is that those who subscribe now, before the price hike, under the old (existing) pricing, will be able to keep their subscription, just as our existing users. They get the ROI course for free; so hurry up, subscribe now. The price for the Full MEDDIC bundle course will increase from $423 per year to $497 per year as of April 30th, 2019. Like most SaaS services, we don’t announce price changes ahead of time. 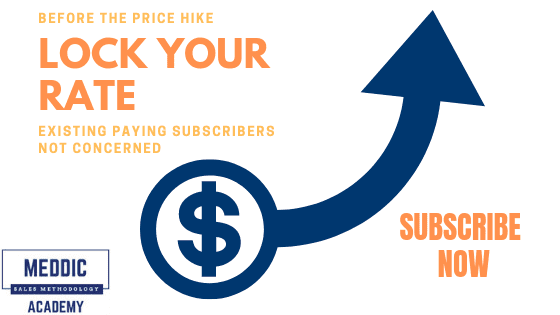 However, we thought those users who took the free introduction course and who are hesitating to subscribe, may love enjoying a for-ever-low-price subscription if they act before April 30th.